Melissa Walker was the first author to stop by We Have Words, and we’re so glad she’s back to celebrate the paperback release of SMALL TOWN SINNERS (out now)! You’ll have a chance to learn more about the book (which is so lovely) later in this post, but first, we want to tell you about a contest Melissa’s running. All you have to do is snap a pic of the SMALL TOWN SINNERS paperback when you see it in the wild, and you could win a whoooooole lotta books! Read more about the contest over at Melissa’s blog. Melissa Walker: Eight: A vet. Eighteen: A writer. Twenty-Eight: Still a writer. Yay! MW: I think Gossip would have fit best, which I’m not proud of. I really did sling a lot of it around, and I didn’t think about repercussions. LAME. I changed though. So that’s good. 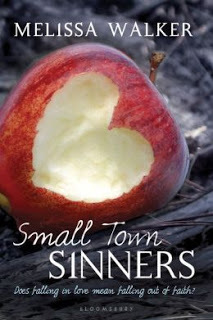 MW: Well, in Small Town Sinners, I’m most proud of the quieter scenes between Lacey Anne and her friends. The Hell House scenes were the ones I was excited to write–they get a little nuts–but the softer ones ended up being my favorites. MW: Anytime these movies are on, I will stick to the couch: Jaws, Point Break, Die Hard, Taken, Some Kind of Wonderful and this year I think I’d add The Perks of Being a Wallflower. MW: Beatles, only because it’s easier to listen to a huge range of their stuff than it is to do Elvis for DAYS, especially if we’re allowing solo careers to mix in. But believe me, I’ve been to Graceland and if someone wants to do Elvis for days, I’m down.